Intensive agricultural practices depend heavily on external input (such as fertilizer and pesticides) application. Rising cost of inputs and its impact on soil environment have been causing farmers to think of alternate practices to sustain soil fertility. Many farmers are beginning to take such initiatives; many farmers in Erode district are focusing their approach towards scientific management of their farming operations. Mr. A. Alagesan, Manager of URC – Thulasiammal Farm, Mylady near Chennimalai (Mobile No.09842135117; E-mail: alagesan.ponnusamy@urc.in) is an innovative progressive farmer in organic farming practices, who developed an effective liquid manure manufacturing technology from cattle resources such as cow dung and cow urine. He is a member of the MYRADA KVK farmers’ forum which provided exposure and guidance in his attempts to look for cost effective methods in fertilizer management in organic farming practices. Capital for purchase of agricultural inputs in dry-land and labour shortage are the key problems faced by him and this is the root cause for the development of this technology. He is a believer in organic farming and says that the digestive material obtained from cattle (i.e. cow dung and urine) is the raw material use in this technology for making the liquid organic manures. The basic principles behind this technology are fermentation and sedimentation process. A simple barrel unit with a capacity of 200 litres is the chamber used for manufacturing liquid manures. Two outlets were fitted in the barrel at the height of 1½ feet and 2 feet from the bottom end and one more at the lower part of the barrel. Fresh cow dung and urine are mixed in the unit at 1:1 ratio. Then 10 parts of water are added and thoroughly mixed and allowed to ferment. This takes 12 hours, after which 1 kg of jiggery is added for every 100 litre fermented solution. Again, it is kept for fermentation and sedimentation processes to take place. (It is location specific, other farm level waste like Palmyra fruit also can be used for the fermentation process) The clear and enriched liquid organic manure is ready for field application in another 12 hours. 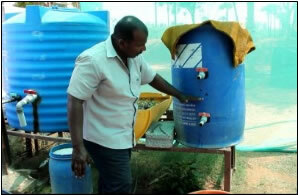 He used this manure mainly for field applications like Moringa, Coconut and Amla crops. The cost of this technology is around 1500 rupees only. By adopting this technique a farmer can save Rs.4000 – 20,000 / ha depending upon the crop cultivation. A simple cost effective fertilizer factory at farm level is ready for self sufficiency in fertilizer. • Increases drought tolerance in crops. This technology takes care of the sustainable soil fertility over a period of time in an eco-friendly manner. The technology would help the dry-land farmers in terms of reducing the external input purchase and improves the micro flora and fauna in the soil ecosystem.